An experienced team provides a happy, stimulating and caring environment to enhance your child’s learning. Carlton pre- school is an established small and thriving pre-school group and is run adjacent to Carlton Lower School every morning during term time from 9:00am to 12 noon. In addition, on Mondays, Wednesdays and Fridays, lunch club sessions are held from 12noon to 1,0pm. The Pre-School also has use of good outdoor play facilities and a ‘Growing Garden’. Government funding is available from 3 years old, and we welcome child care vouchers from all the main providers. 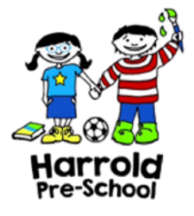 Harrold Pre-School is a registered charity and member of the Pre-School Learning Alliance. It has a welcoming community atmosphere, where children forge and foster relationships. Located in the Harrold Centre, we have plenty of space and run two rooms on the basis of academic year groups: Dolphins takes children from 2 ½ years and Sea Lions is for those starting school the following September. We also have an excellent outdoor play area, featuring grass and tarmac pathways. The existing Harrold Lower School and Harrold Priory Middle School are now part of the Sharnbrook Academy Federation and will be moving to a two tier system from September 2017. Part of the Sharnbrook Academy Federation .